Beautifully swirled in green, black and with hints of turquoise in its depths, malachite is a stone of mystery. Stare into its depths for as long as you will, it's still not likely to give up its secrets. 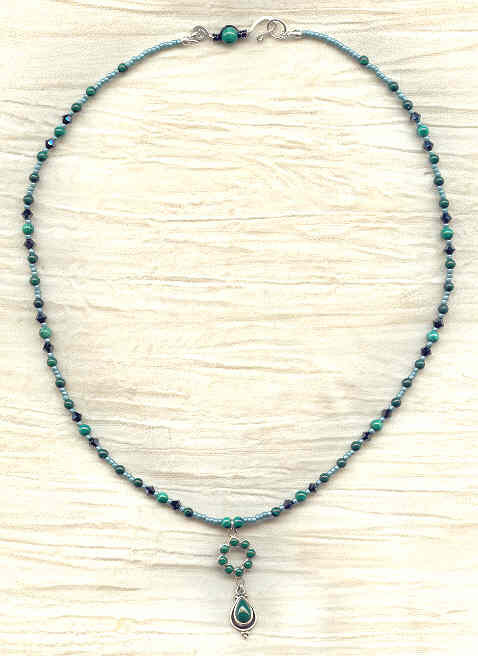 This delicate necklace features 4mm and 3mm round malachite beads interspersed with sparkling Swarovski Crystal hematite-coloured bicones. The larger beads are spaced with seed beads in a misty blue/turquoise/aqua colour that plays up the richness of the malachite. 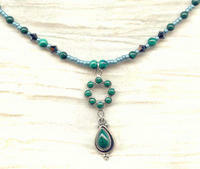 The strand closes with a hand forged sterling silver hook, set with a malachite bead. The pendant drops about 1-1/2 inches below the strand, and features a sterling silver link set with eight tiny malachite cabochons, and a sterling silver malachite teardrop-shaped drop. This dainty beauty is perfect for a young girl, but who's to say an older girl wouldn't like it, too? Rainbow moonstone and labradorite have one thing in common: both stones have a blue glow when the light hits them in a particular way. Beautifully mottled in shades of raspberry and grey, rhodonite is a stone whose warmth belies its cool colour.